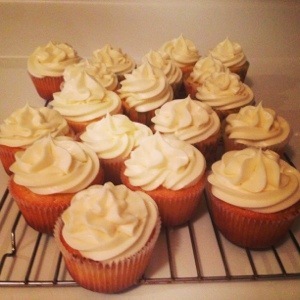 There are many recipes for coconut cupcakes out there, I have tried many of them. My second favorite is from Baked: New Frontiers in Baking. Their recipe includes making a coconut pastry cream which is incredible but it requires a lot of work. Ina Garten has created a perfect cupcake in this recipe which takes just 30 min of actual work to create. The only thing that bothers me about this recipe is the buttermilk. For some reason I have not embraced buttermilk as a refrigerator staple. I bought almond extract for this recipe and it is a worthwhile investment. You will absolutely make these cupcakes more than once. Serve these with prosecco. 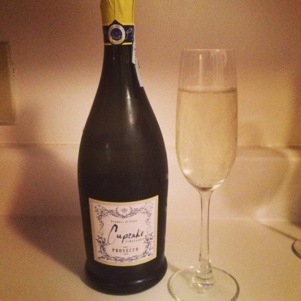 One of my favorite budget sparklings will be delightful with these: Cupcake Vineyards Prosecco NV. It is made from 100% Glera grapes (the grape for proseccos) but it is not overly fruity and sweet like some other proseccos. In the bowl of an electric mixer fitted with the paddle, cream the butter and sugar on high speed until light and fluffy, about 5 minutes. With the mixer on low speed, add the eggs, 1 at a time, scraping down the bowl after each addition. Add the vanilla and almond extracts and mix well. In a separate bowl, sift together the flour, baking powder, baking soda, and salt. In 3 parts, alternate adding the dry ingredients and the buttermilk to the batter, beginning and ending with the dry. Mix until just combined. Fold in the coconut. Line a muffin pan with paper liners. Fill each liner with batter nearly to the top. Bake for 25 to 35 minutes, until the tops are brown and a toothpick comes out clean. Allow to cool in the pan for 15 minutes. Remove to a baking rack and cool completely. Frost the cupcakes and sprinkle with coconut if you desire.